Gila Mexican Spotted Owl Study /Hawks Aloft Inc.
Did you know that only the females in Mexican Spotted Owls exhibit a brood patch? 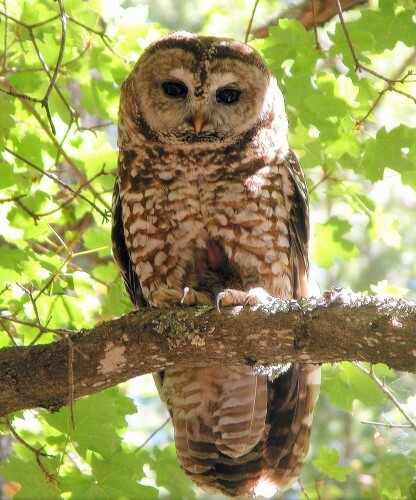 This female was photographed by Mike Fugagli, our biologist who is studying 12 historic territories in the Pinos Altos Mountains of southern New Mexico. The roost and nest location for this beautiful bird is in an equally beautiful canyon filled with golden columbine. Her nest, often characteristic of the subspecies, is in a cliff cave.